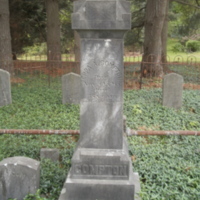 The Compton Family Cemetery is located on Henderson Road in Clifton Virginia. There are 10 members of the Compton Family buried in this cemetery, which is located next to the Compton House. The Cemetery is surrounded by a wrought iron fence, and is well maintained. The Compton Family resided in the area from 1876 until 1958 and made a living from farming. 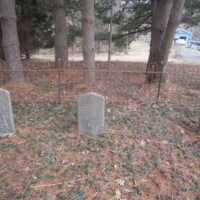 This is a picture of the Headstones of Harry, Mittie, and George Compton. They died between the years of 1892 and 1898 at young ages (23, 20, and 15, respectively). 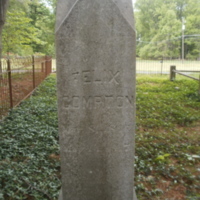 This is a picture of the side of the Headstone dedicated to Felix Compton. Felix Compton was born on March 8, 1846 in Alexandria. He married Eloise Fairfax on December 14, 1871, and they settled in Clifton, Virginia, in 1876. 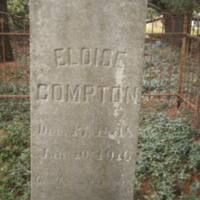 This is a picture of the side of the Headstone dedicated to Eloise Compton. Her husband, Felix, is on the opposite side. 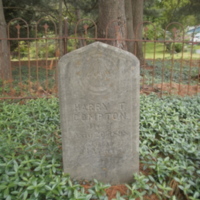 This is a picture of the Headstone of Harry T. Compton, who was the third son of Felix and Eloise Compton. He was born in 1875 and died August 20, 1898 at the age of 23. 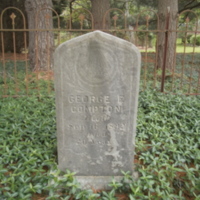 This is a picture of the Headstone of George Compton, firstborn son of Felix and Eloise Compton. He was born in 1872, and was died September 16, 1892 at the age of 20. 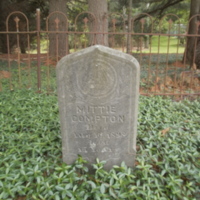 This is a picture of the Headstone for Mittie Compton, daughter of Felix and Eloise Compton. She was born in 1883 and died August 16, 1898 at the age of 15. 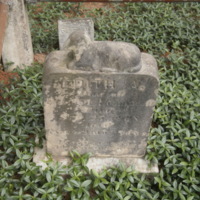 This is a picture of the Headstone of Edith A. Compton, daughter of Eppa A. Compton and Minnie A. Marshall. She was born February 20, 1901 and died on September 25, 1908. "A Lamb on Earth, An Angel in Heaven"
This is a picture of the Headstone for Felix and Eloise Compton, as well as the Footstones on either side. 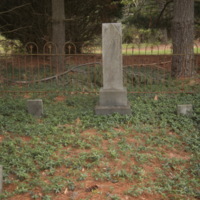 Felix Compton is buried to the left while Eloise is on the right. 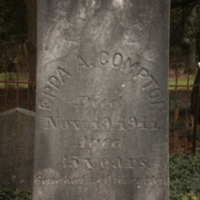 This is a picture of the headstone of Eppa A. Compton. He was the fourth born son of Felix and Eloise Compton.